If you love ponte knit, give this ponte version of the Shaper jean a try. 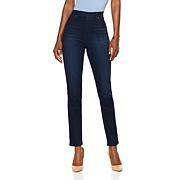 Featuring a smoothing panel at the tummy area, this luxurious jean provides a boost of confidence. Consider them a dressy version of a classic skinny jean, something you can wear anywhere and feel appropriately dressed. They're super comfortable, too, with an elastic-backed waistband for ample stretch. Love these pants, ordered 3 pairs. 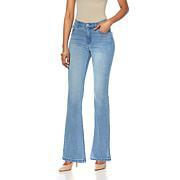 The knit jeans were soft and flexible, plus the shape and control was great.I'm 5'1" and wear petite 1x. Thank you for the sizing. Pls provide more colors. Just received these today. Tried them on right away. My new favorite. Diane really hit the mark with these jeans. Please, please offer them in more colors. They fit like a dream. These pants are so comfortable and they make your body look good. I got the Indigo and I love the dark blue color just what I wanted. These looked great. However, when I tried to get them on, they weren't even close to fitting. I have been wearing Diane Gilman pants, leggings, and jeans for years--all in the Medium-Tall size. I have some on right now. These were not even close to the same size. Back they go.